An admirer of Bonnard and Vuillard, Sickert and William Nicholson, Diana Armfield turned from design to painting early in her career, and has worked for over seven decades in a range of media to produce a strong body of harmonious images. These encompass sensitive botanical still life compositions, atmospheric landscapes and evocative figure groups. Diana Armfield was born in Hightown, Ringwood, Hampshire, on 11 June 1920, the younger of two daughters of Joseph Harold Armfield, a Quaker who was the director of the Vale of Avon Iron Works, and his wife, Gertrude (née Uttley). Her uncle was the artist, illustrator and writer, Maxwell Armfield. She attended Bedales, a co-educational independent school in the village of Steep, Hampshire, and there she studied art with the inspiring teacher, Innes Meo. She was also affected by a meeting in Paris with the influential French textile designer, Paule Marrot. Though she did not take art for her school leaving certificate, ‘it was always assumed that I would go to Art school’, she has explained (to James Fairweather in 2013). Diana Armfield attended Bournemouth Art School for one year, the highlight of which was a trip to the Soviet Union with a group of teachers. She then went to the Slade School of Art, during its evacuation from London to Oxford, and responded well to the combination of theoretical and practical teaching. While there, she also met fellow painting student, Bernard Dunstan, who would become her husband. In 1942, she left the Slade without taking her diploma in order to undertake war work as a Cultural Activities Organiser for the Ministry of Supply. However, the lack of a diploma did not stop her receiving a place at the Central School of Arts and Crafts in 1947. Studying under Bernard Adeney and Dora Batty in the textile department, she soon founded her own textile company with fellow student, Roy Passano. They involved themselves in all stages of the process from design to sales, and showcased the results at galleries in South Molton Street (1947 and 1948) and at the Artists’ International Association. Their work was also sold through such top retailers as Heal’s, and their clients included the architects, artists and designers, Eileen Agar, Misha Black, Wells Coates, Duncan Grant and Milner Gray. The Victoria and Albert Museum acquired examples of their work in 1949 and, in the same year, they both became members of the Society of Industrial Artists. Then, in 1951, their partnership reached its culmination, when they were invited to contribute to the Festival of Britain and had three of their first wallpaper designs launched by John Line & Sons. Armfield-Passano operated from a studio at the bottom of the garden belonging to Diana’s elder sister, Kay, at 7 Lambolle Road, Belsize Park. This also became her first home with Bernard, following their marriage in 1949. When she gave birth to their first son, Andrew, in 1950, they moved into an upstairs flat. Then in 1952, on the birth of their second son, David, they moved to Kew. With the birth of their third son, Robert, in 1955, the family became Diana’s priority. And, as her business partner, Roy Passano, had migrated to Canada, her creative life was put on hold. and then, as she remembers, ‘the principal announced that I would be teaching painting as well as drawing the following term ... Bernard quickly made me an easel box and we went to Arezzo in Tuscany together for two weeks, painting every day. I’ve never looked back!’(quoted in Fairweather 2013). She continued both to design and teach until 1965, but painting increasingly absorbed her, and from that year she took it up full time, also beginning to exhibit the results regularly at the Royal Academy. An article that she published in The Artist in 1966, entitled ‘An Introduction to Designing Wallpapers and Fabrics’, brought the first phase of her career to an end. Exhibiting in many mixed shows through the 1960s and 70s, Diana Armfield was elected a member of the New English Art Club in 1970, a member of the Royal West of England Academy in 1975, and also an Associate of the Royal Cambrian Academy, Conwy, in 1973. She began her close association with Wales when her parents gave her the house, Llwyn Hir, in Parc, near Bala, in Gwynedd, and she held solo shows at the Tegfryn Gallery, Anglesey, in 1975 and 1978. 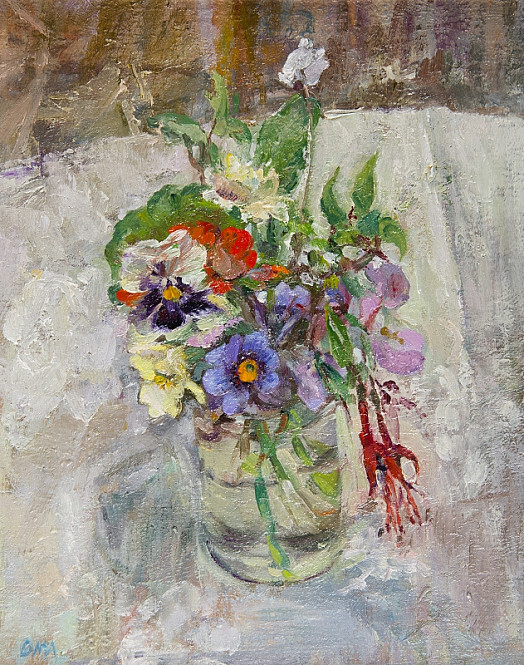 Beginning to be represented by the London dealer, Browse & Darby, in 1979, Diana Armfield was elected to the Royal Watercolour Society in 1980 and, from 1981, served as a Governor of the Federation British Artists (an association of nine leading art societies, including the New English Art Club and the Pastel Society). 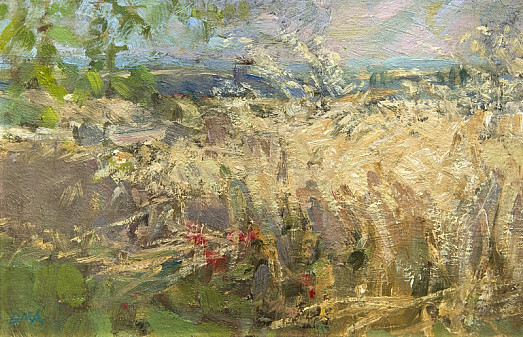 In her burgeoning role as a leading figure among traditional British artists, she also produced a number of guides, including The Simon & Schuster Pocket Guide to Painting in Oils and The Simon & Schuster Pocket Guide to Drawing (both 1982), and Drawing and Painting in Oils (two Mitchell Beazley handbooks, both published in 1983). During the late 1980s, her profile was further raised by two international artist’s residencies (with Bernard Dunstan), some significant commissions and a retrospective exhibition (also with Bernard). The first artist’s residence took place in Perth, in Western Australia, in 1985, and the second in Jackson, Wyoming, in the United States, in 1989. The commissions included one from the National Trust’s Foundation for Art in 1988, and another from the Prince of Wales in 1989, to paint the interiors and gardens of Highgrove, his home in Gloucestershire. The retrospective was held at the Davies Memorial Gallery in Welshpool, in 1988. Her achievements were crowned by her election as an Associate of the Royal Academy in 1989 and as a full Royal Academician in 1991. 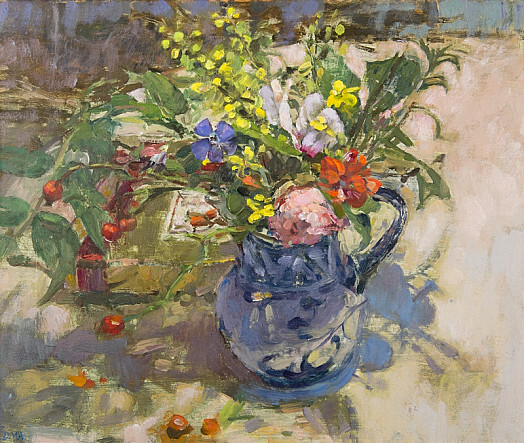 During the last two decades, Diana Armfield has continued to exhibit widely and frequently, and has held a number of solo shows, including those at Browse & Darby (2000, 2006, 2010), the Royal Cambrian Academy (2001, 2011), The Albany Gallery, Cardiff (2001, 2006), Sheen Gallery, London (2004), the New Academy Gallery, London (2005) and the Mall Galleries, London (2013). A joint show was held with Bernard Dunstan at the Royal Academy in 2015-16. Her work is represented in numerous public collections, including the V&A (textile work) and the Royal West of England Academy (Bristol).